I received my WhisperLite as a Christmas gift from my parents in 1989 and still remember the first camping trip with it near Victoria BC in May 1990 (photo below.) Since then it has been part of my 20+ years of adventures. Ever dependable. warming food and boiling water as I hiked the remote peaks of British Columbia and traveled along the coast. 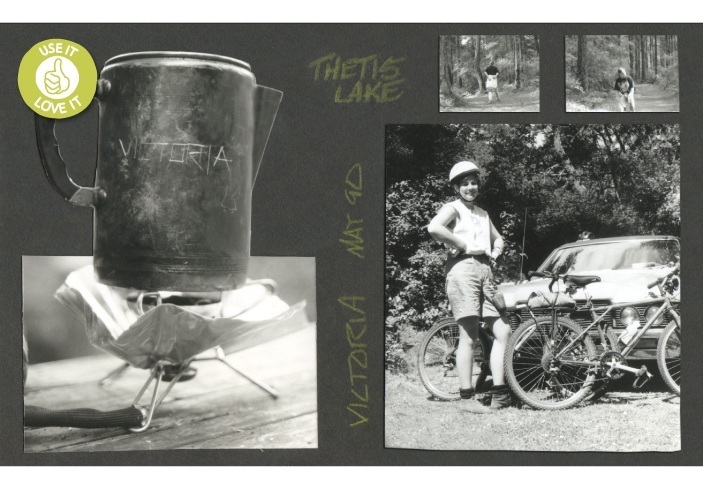 It is the small portable hearth that we gather around on a boys trip up a mountain or a family bike camping trip to the Gulf Islands. What I love about this design, besides it’s role in making these adventures possible and more enjoyable, is it simplicity in both function and aesthetics. Functionally, it is light weight and folds compact for easy transport, it easily folds open and becomes a stable platform. I love the ritual and experience of lighting it, pumping up the bottle, releasing a small amount of gas into the bottom cup and lighting it to prime the stove and then the glorious hiss of the blue flame as you turn it on. If there is a problem, all the parts are easily disassembled, cleaned and put back together, another wonderful experience and ritual. Aesthetically this product is beautiful in the old “Form Follows Function” way. The aesthetic comes from the functional aspects of the product and has no additional parts or decoration, not even a MSR badge or branding label. Over the years this product has developed its own personality as it blackens with use. All these years later, the design of this product has changed very little. I look forward to using my WhisperLite for another 20 years and see no new products on the market that would lure me away from her.